The FIN E cig menthol cartomizer pack produces the same cool, minty menthol taste found in FIN disposable menthol e-cigarettes & FIN menthol starter kits. The Bold Menthol is the strongest menthol flavor in the FIN range. The FIN menthol refills pack is the equivalent of approximately a carton of cigarettes (each of the five cartomizers should deliver around 400 puffs), so using FIN e-cigarette refills can be as much as 85% cheaper than smoking cigarettes. Fin is an über cool e-cigarette brand with an authentic cool, minty taste and excellent packaging, style & overall theme. The cartridge refills not only offer a great taste, but their size allows for plenty of puffs without the need to change cartridge too often. Please note, it is recommended you change your FIN e-cig battery every 6-8 weeks depending on use. Barely any smoke or menthol taste. Like the flavor of this menthol but the FIN e-cigarette battery does not last very long, best to get a few batteries if you want to be able to smoke often. I really like the Fin products. I particularly like the white light instead of red. They are not harsh and do not irritate my throat. Very nice. I was a heaving smoker for 55 years but vaping saved my life! I have been vaping for several years. but after a couple years I started having breathing problems when using the refill tank versions. I figured I would have to quit vaping, it got so bad I would wait until just before going to bed to vape. I was ok if sitting but if I got up to walk my lungs would freeze. But I realize now that if I use these Fin cartomizers I don't have a problem really. It has to be Fin brand. I can't use the other cartomizer brands even. And yes I have tried all the variations of e juice ie PG or VG mixtures. I don't want to quit so I am so glad I have something I can use. I thought FIN stopped making these, but I sure hope they don't. I just stocked up with 12 packs of cartomizers! Thank you Electric Tobacconist for having these!! Whoops I meant to be on Regular not Menthol. oh well I will leave a review there also. If you are having trouble sometimes you might want to try FIN brand. I really do love the Fin menthol Bold and the Cool Menthol. I haven’t used tobacco cigarettes in more than 4 years. Very dependable and long lasting product. Love the menthol flavor. I have purchased the mild menthol 10 pack because I like the idea and the price, but the flavor is mild. I prefer the Bold Menthol and I would like to see if you could offer these in a 10 pack. Just what we wanted, perfect and quick shipping. Excellent value and terrific quality. Compared to similar products like Blu ecigs, these are a great deal and I personally prefer the "smoking" experience. 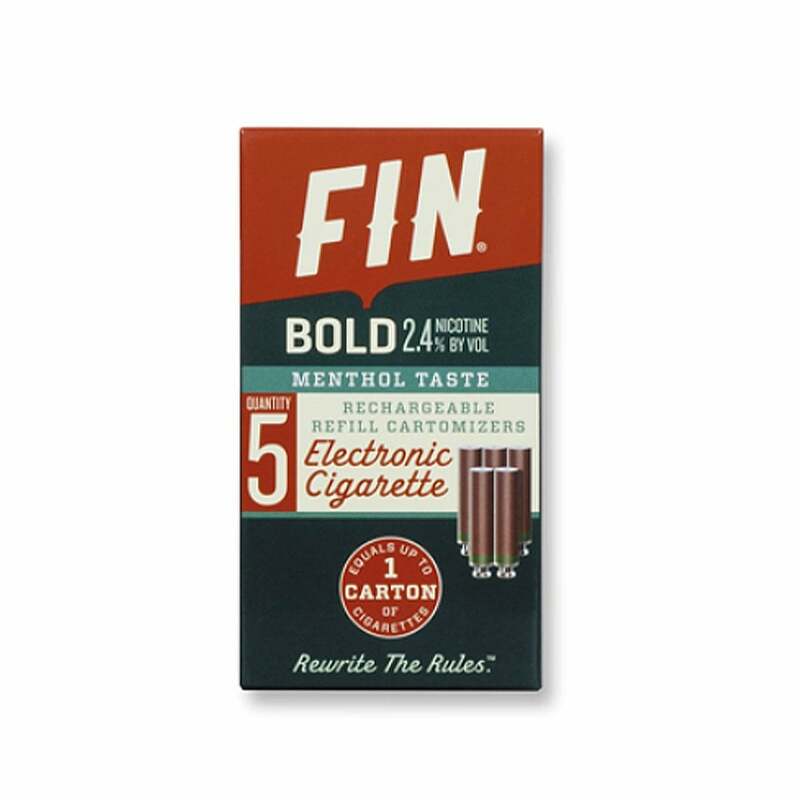 I have tried every electronic menthol cigarette out there and FIN is the only brand that tastes good! It tastes like fresh and minty. It is the only brand that does not taste toxic. It does not leave a chemical taste in my mouth like all of the others. what would make this company a lot better is to give their customers an incentive to buy more. For instants I would buy six packages of these if I got a 25% discount. Danny L Greg brought up quick delivery keep it up guys good work! After trying many, many menthol e-cigarettes, I have found the Fin menthol brand to be the most satisfactory. It is the only brand I will buy now.